With the Sleep Safe Bed Rail you can sleep easy knowing you have the support you need. It offers stability while standing, and can be extended to prevent night time falls. It also pivots down and out of the way when not in use to maintain the comforting feeling of your bedroom. • Two products in one - Half size bed rail extends in length for fall protection at night. • Rail Pivots - The rail pivots 180º down and out of the way when not in use. • Designer Organizer Pouch - Leather-like organizer pouch keeps handy items close by & doesn't spill when rail pivots down. • Safety Strap - Secures to the bed frame with included safety strap. • Easy Assembly - Installs in minutes with 5 bolts & included tool. • 300 lb Weight Capacity. • Base Length is 25". • Base Width is 18"-20". • Width of Rail locks in place at 26", 34" & 42". • Height of Rail adjusts 23" to 25" from the base of mattress. 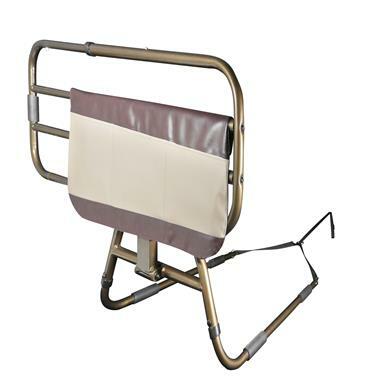 • Attaches to most any home or common adjustable bed with included safety strap. • Fits mattress height of 12"-18".